The solution for many space-starved gardeners is to grow their potatoes in containers, and not just pots but sacks, stacked tyres, old potting soil sack, the kitchen sink – you name it. Given its vigor the humble potato is happy to call just about anywhere home, so long as a few basic rules are followed. An eruption of lush foliage, courtesy of a few carefully positioned pots, can even become a feature, particularly on the patio where they would make the perfect foil for showier specimens. Don’t worry, there aren’t many of these. The most important rule is to match the number of seed potatoes to the size of container you are growing them in. As a rough guide each potato plant needs about 10 litres, that’s just over 2.5 US gallons, to grow into. Cramming your potatoes in is a false economy, the result being very small spuds, if you’re lucky enough to get any at all. A typical garbage can-sized container would hold around four plants. Potato growing sacks sold specifically for this purpose, would house three. It really doesn’t matter what container you use, so long as it has adequate drainage holes at the base to allow excess water to freely drain away. Almost as important is what type of potato you grow in your container. First and second early varieties work best and have the added advantage of being done and dusted before the ever-present threat of potato blight arrives on the scene later on in summer. Salad potatoes work especially well and I love the variety ‘Charlotte’ for its firm-yet-creamy, oval tubers. Others worth seeking out are flavorsome ‘Lady Christl’, the appropriately named ‘Rocket’ and quirky, nutty-flavoured ‘Anya’. The final rule is to keep your potatoes well watered. While ground-grown plants have the luxury of reaching down to chase valuable soil moisture, their container cousins have no such luxury. Be on hand to water plants as they grow and particularly once the foliage has filled out. Actively growing plants will also benefit from a couple of liquid feeds during their growing time; use a balanced organic fertilizer such as seaweed extract. 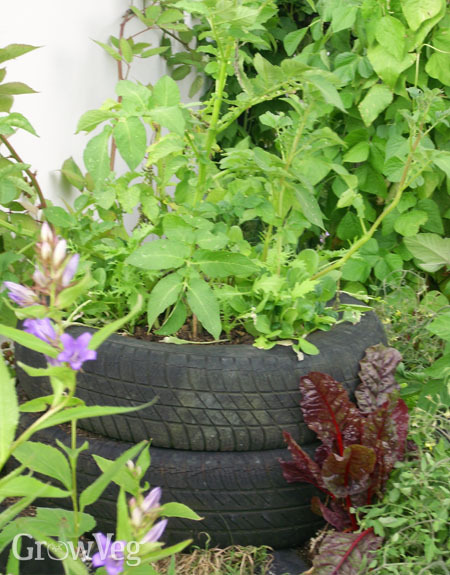 Add some additional drainage material such as crocks or broken up polystyrene to the base of your container then fill with about 10cm (4in) of your growing medium. You have a few options here. Multipurpose potting soil works well, but I bulk this out (mainly to save money!) by mixing it with good garden soil and some of my own garden-made compost. You can also add a couple of handfuls of organic fertilizer, such as chicken manure pellets, for good measure if you wish.